The author addresses the question of what it means to be a Quaker today and considers the third strand of Christianity, the other two being Catholicism and Protestantism. Edwin Bronner (1920-2005) wrote the history of the Religious Society of Friends and helped to reunite the two Philadelphia Yearly Meetings (Hicksite and Orthodox) in 1955. As a professor of history and librarian of the Friends Historical Library at Haverford College, he wrote extensively. His writing addressed the specific details of Quaker history from the land grants of William Penn to the rise of liberalism in London Yearly Meeting. He served on the boards of the American Friends Service Committee and Pendle Hill, and was chair of the Friends World Committee for Consultation during their conference at Guilford College in 1967. 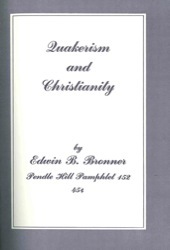 Bronner’s writing sought to reinvigorate contemporary Quakerism through an enriched understanding of its history and traditions. In this pamphlet, Bronner discussed the historic role of Christ in the Religious Society of Friends.